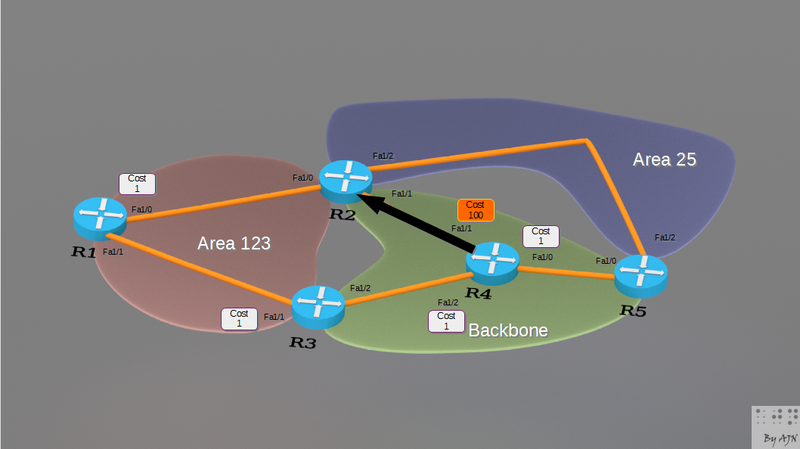 OSPF inter-area and intra-area routing rules | CCIE, the beginning! ← GET VPN, it is all about group. The following lab focuses on intra-area and inter-area route selection process. 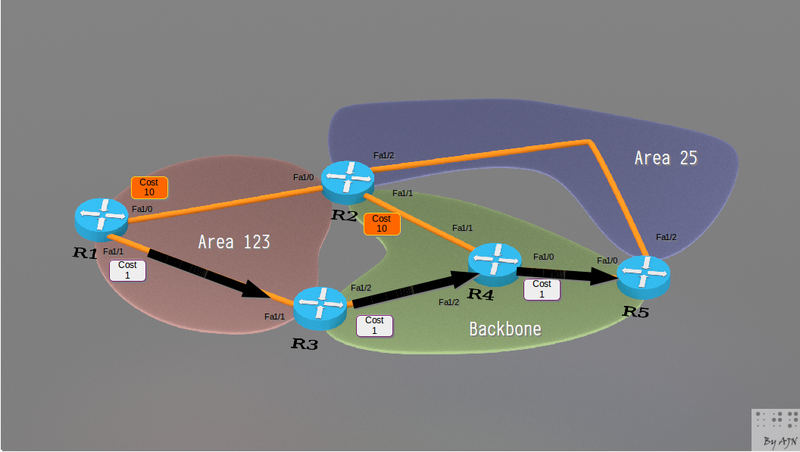 For the sake of clarity, I put the final conclusions first, wrapped in a table form, with some explanations to ponder upon, followed by the different lab cases used to check OSPF route selection rules. 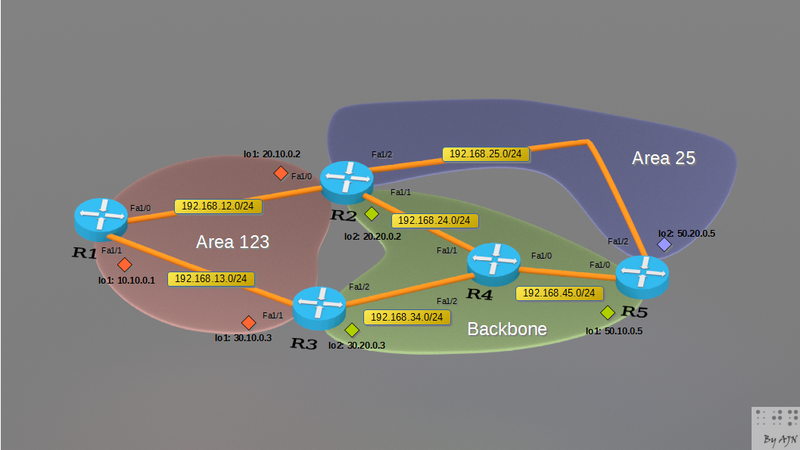 For each case, I used interface costs and states to illustrate OSPF selection rules in action. – Intra-area routes are always preferred over inter-area ones. 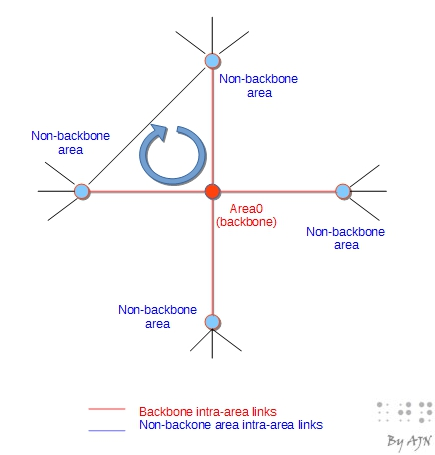 – Intra-area routing to a destination inside a non-backbone area will take the shortest path without traversing the backbone area.- Intra-area routing to a destination inside a backbone area will take the shortest path without traversing a non-backbone area. – ABR’s advertise only intra-area routes from non-backbone area to the backbone area and advertise intra-area and inter-area routes from backbone area to a non-backbone area. – ABRs do not take into account in SPF calculations LSAs received from non-backbone areas. 2. Inter-area (IA) – Inter-area route between two non-backbone areas must pass through the backbone area. – Inter-area route will take the path with the shortest total cost. 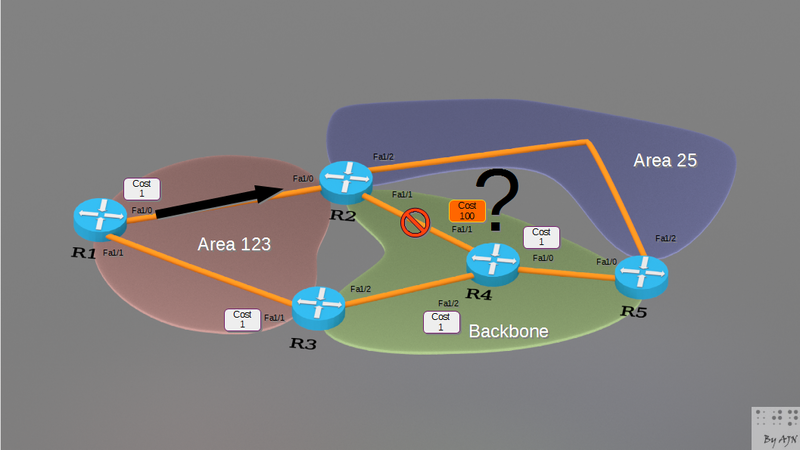 For more information about comparing OSPF external routes, please refer to the lab OSPF external E1, E2, N1, N2…Who is the winner? 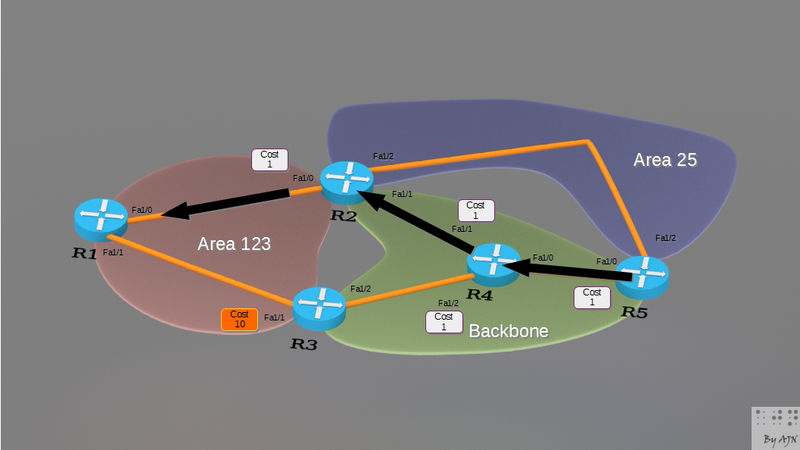 OSPF prevents inter-area routing loops by implementing a split-horizon mechanism, allowing ABRs to inject into the backbone only Summary-LSAs derived from the intra-area routes, and limiting ABRs’ SPF calculation to consider only Summary-LSAs in the backbone area’s link-state database. intra-area, inter-area, type 1 external or type 2 external. To understand OSPF mechanism of loop prevention, think conceptually of OSPF areas as nodes in a loop-free tree with depth never bigger than 2. Throughout the lab, I am using cost to manipulate route selection. 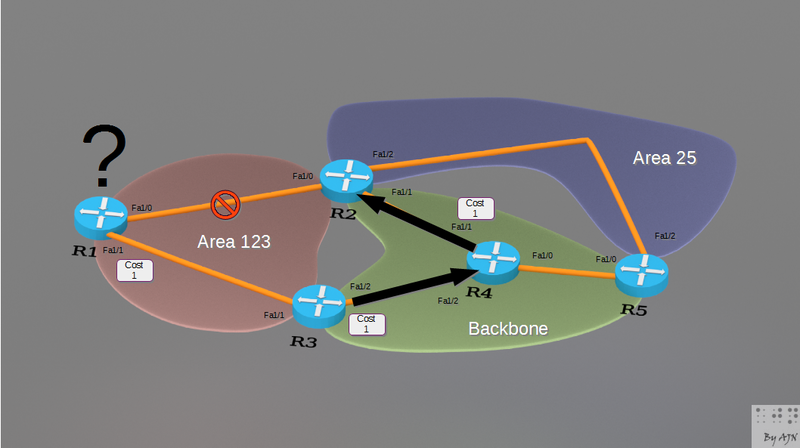 OSPF takes into account the cost of output interface toward the destination, so be careful when you change the cost on one end of a link, this can cause unwanted asymmetric routing. IGP protocols split the router (advertise routes through interfaces) whereas BGP splits the link between routers, this fundamental difference should be clearly depicted in the topology to avoid confusion. 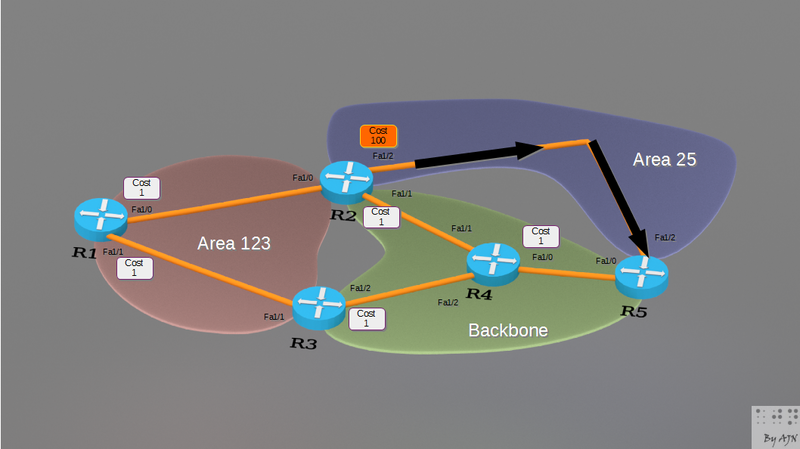 If you are advertising your loopback networks with mask less than 32 you will have to to set their ospf network type point-to-point (refer to this lab for more information). Observe the ospf database inf. 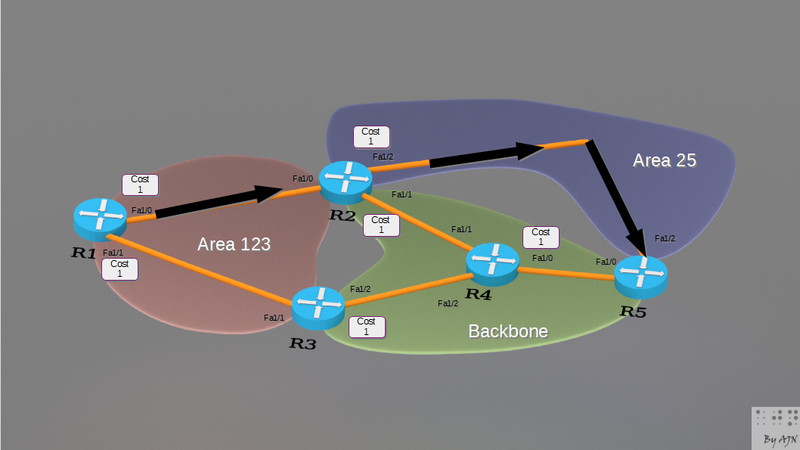 for LSA3 “Routing Bit Set on this LSA“, this is a Cisco-specific implementation of OSPF protocol, indicating that a specific LSA is taken into account in the calculation of the best route. Multipath selection is considered locally through FIB and provided by CEF load balancing mechanism, if there next-hops leading to the same destination. Multipath is not considered because there is only one next-hop (R4) in the FIB. With unequal costs to ABRs and unequal costs advertised by ABRs, R1 OSPF has chosen the path with the lowest total cost to destination: cost to ABRs + cost of LSA3 summary advertised by each ABR. 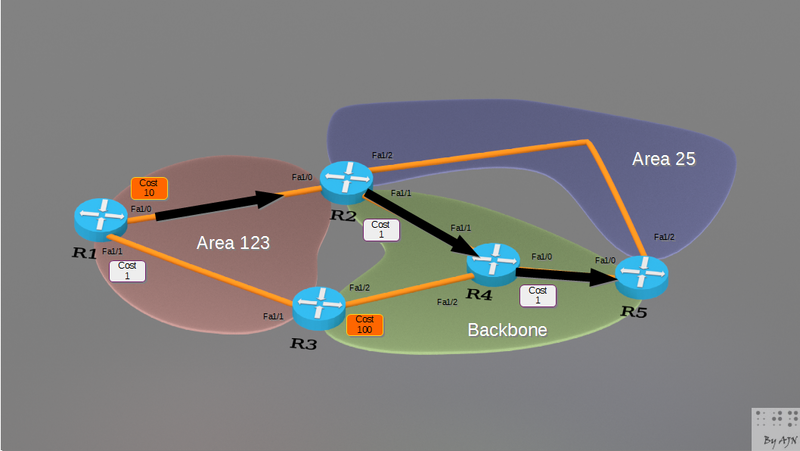 With unequal costs to ABRs and unequal costs advertised by ABRs, R1 OSPF has chosen multipath because of the equal total cost to destination: cost to ABRs + cost of LSA3 summary advertised by each ABR. 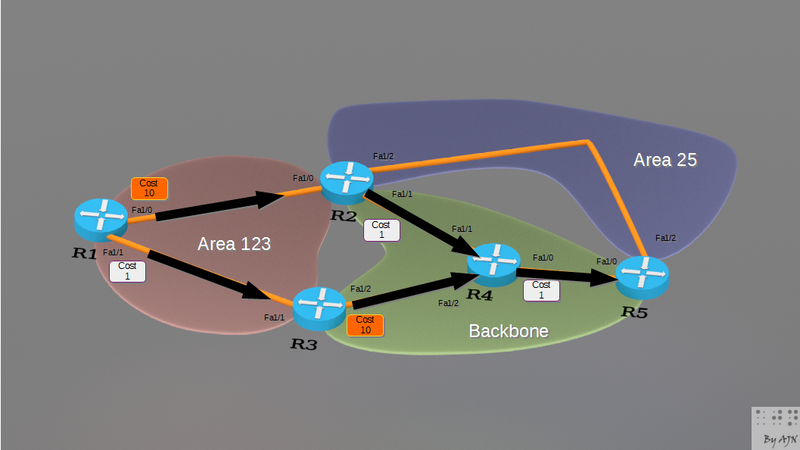 Note that OSPF on R5 did not choose the shortest path to ABR (R3), but the total cost. 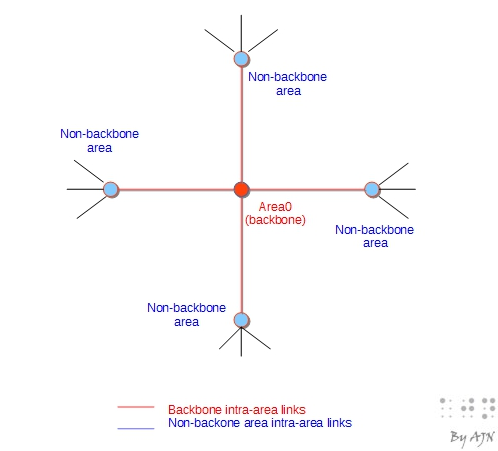 R4 chose the worse path through R2 inside the backbone without crossing non-backbone area. Traffic between two non-backbone areas. From area123 to area25. 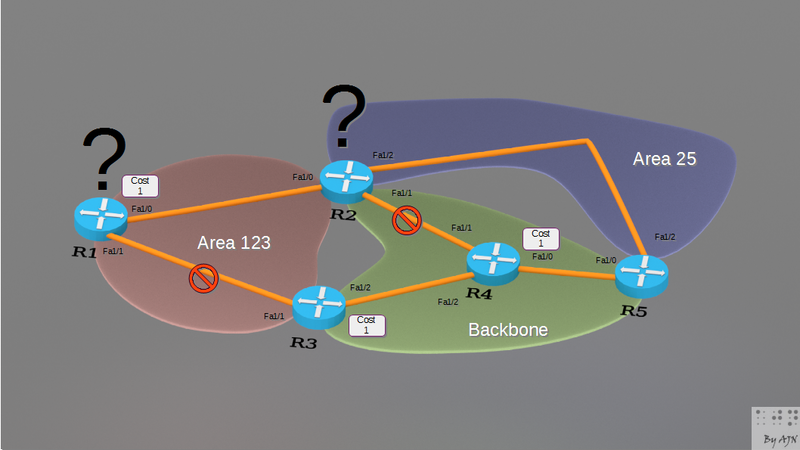 From R1, OSPF will choose the path with the lowest total cost within area 123, the backbone and area 25. This happens to be the path through R2, which is directly connected to area25. This seems to defeat the rule B, but it doesn’t, because the ABR R2 has an interface in the backbone. Traffic generated from R2: 20.10.0.2 (area 123) to R5 50.20.0.5 (area 25). 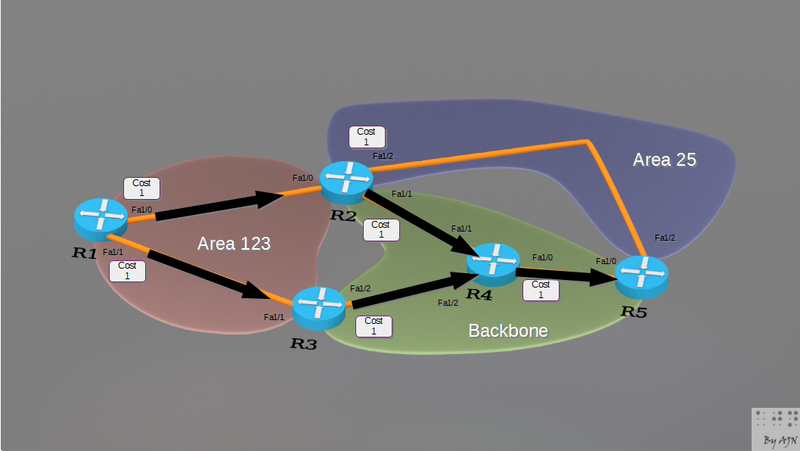 Even though inter-area link cost is made worse (higher cost), R2 ospf will choose the shortest path without crossing the backbone. Note that, as soon as R2 interface connected to the backbone is down, R2 can no more reach area25. And R1 will turn to the path advertised through R3. Even though R1 link to R2 is up and R2 link (area 25) to R5 is up, R1 will not be able to use the inter-area path, because it doesn’t cross the backbone (not even a connected interface to the backbone). Great post I must say AJN! Link between R1/R2 is Area 0, and link between R2 and R3 is Area 1. 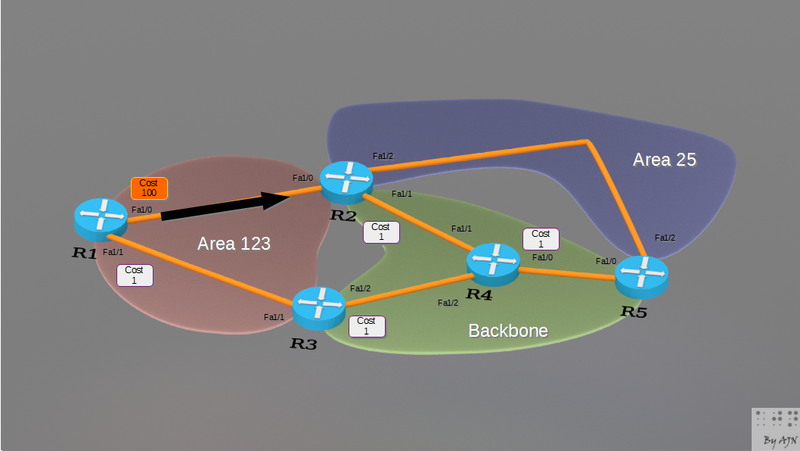 Lets say we have a loopback (11.0.0.1/32) on R1 and R3 and we advertise the loopback on R1 as part of Area 0, and the loop back on R3 as part of Area 1. If we are on the ABR R2, which path will it chose and why? I am of the opinion that if you guess the output and then check (in this case with GNS3) if it is what you guessed, it helps understand ideas better. So, here I am… guessing. I guess it would hit R3. 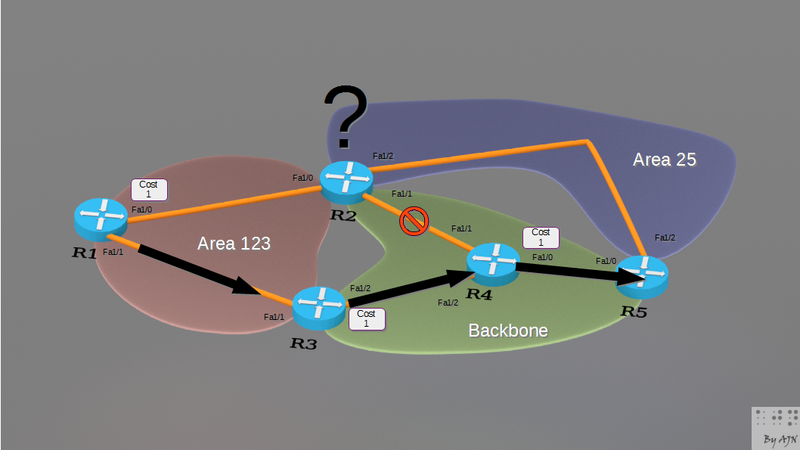 Reason: target prefix is reachable via non-backbone intra-area route. However, going further, data traffic always originates from hosts, while routers are only transit devices. Meaning, instead of saying ‘we are on ABR R2’ you must be actually asking yourself ” if we originate traffic ‘from a link’ ‘IN area x’ ‘on ABR R2′ which path will it choose’. i’m a little confused as to why cases 1 through 6 don’t use area 25 to get to or from R5, but in cases 11 & 12 area 25 is used to connect with R5. Are you able to explain why that is? Why cases 1 through 6 use area 0 to get to R5 but cases 11& 12 use area 25? 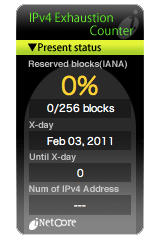 i see the console output now, your connecting to an IP in the area 0 in cases 1-6 and area 25 in cases 11 – 12. the question now is how do you ensure the IP in R2, R3 & R5 are in the desired areas?